WaterBook Press, 2012, 278 pgs, Nonfiction. Kay Wyma’s wake-up call came when her fourteen year old son asked her which luxury vehicle he would look better in when he turns sixteen; a Lexus, Porsche, or Maserati? She could not believe how deeply entrenched youth entitlement was in her children! Thus began the 12-month experiment to rid her home of entitled attitudes. 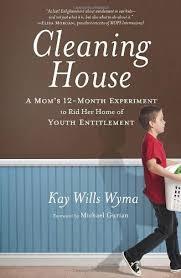 Dubbed “the experiment,” Wyma designed a task each month to empower her children specifically with work, household chores, manners, and serving others. Throughout the book she considers how both her actions and those of other parents lead to entitlement attitudes in today’s youth, and that these attitudes teach children they are incapable of succeeding on their own. For me this book had the unexpected effect of inspiring me to conquer my own clutter habit! My own clutter habit aside, Cleaning House is a great case study for challenging entitlement in children. I liked how willing Wyma was to admit the huge role she played in her children’s entitled attitudes, and I like how she resolved to stop contributing to the problem. If you are looking for scientific information on youth behavior, this is not the book. But if you are looking for ideas and encouragement to challenge entitlement attitudes in your home, this is exactly the book you are looking for.